Here comes another quick 30-minute meal. I was feeling lazy and didn’t want to go to the supermarket, so I snipped a few leaves of kale from the backyard to add to spaghetti. 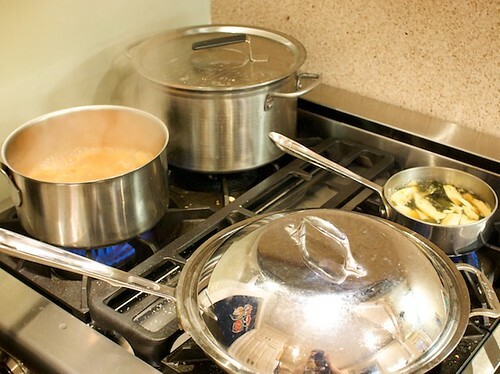 Boil water and cook pasta to just before it’s done. While the pasta is cooking, sautee chopped garlic, crushed chile, and kale leaves in olive oil on low heat. Salt that mixture to taste, but it’s ok if it’s a little under salted if you’re used salted pistachios like I did. When the pasta is about to be done, add in a few teaspoons more oil and the crushed pistachio to the pan and toss to mix the ingredients. When the pasta is just about done, turn the pan with the kale’s heat to high, add in the pasta and 1/2 cup pasta cooking liquid. Stir and toss to distribute everything. This should make a sticky, creamy sauce as it cooks down. If the pasta is still too chewy for your taste, add more pasta cooking liquid. Salt to taste. When it’s done, turn off the heat, squeeze half a lemon over it, stir, and it’s done. For a complete meal, I like topping it with a runny fried egg. Heat water (with a generous couple of pinches of salt added to it) to boil pasta and put pasta in once water comes to a boil. In the mean time, in a frying pan, heat olive oil, roughly chopped garlic, anchovies, aleppo pepper, and cracked black pepper over super low heat. The anchovies should end up disintegrating into the oil. Make sure the heat is low enough not to brown the garlic. 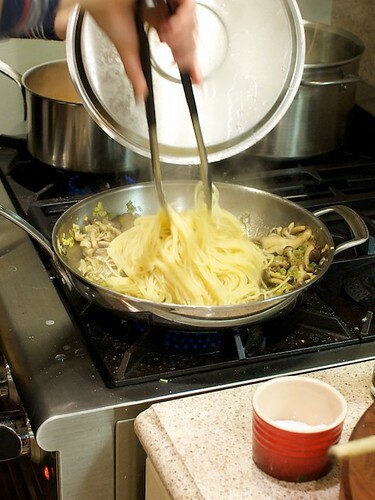 When the pasta still has some bite left, take it out with a pair of tongs, turn the heat up to high on the frying pan, and throw the pasta in there. It’s ok if you haven’t completely shaken out all the water from the pasta. You want it to be still somewhat wet. Stir and toss pasta in the frying pan, throw in half a cup of pasta cooking water and scrape up any stuck bits on the bottom, turn the heat down to super low again. 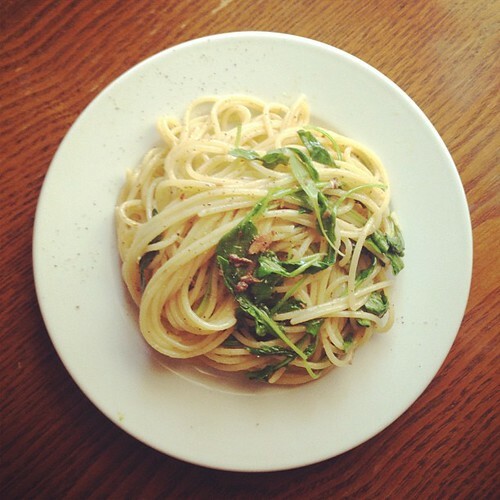 When the water has turned the anchovies and oil into a thin sauce, stir in the arugula. Turn the heat off, stir some more till the arugula is wilted, add more cracked black pepper, and serve. By this time, I find that the pasta water and anchovy and oil have made a pretty tasty, savory, sauce to coat the pasta. 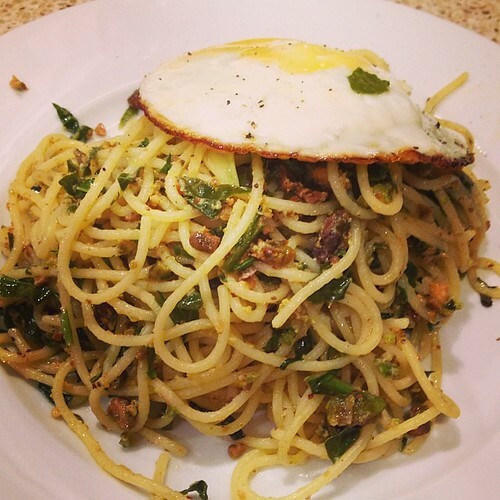 I thought I was pretty smart about incorporating arugula into this pasta, but then while I was writing this post, I found that Mark Bittman has a recipe for this too! I made mussels for the first time tonight for dinner. They were steamed with a white wine and tarragon broth. 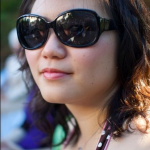 Being Chinese, I dropped a couple chunks of garlic in the broth since that’s what I always do when I cook seafood. It was a pretty easy dish to prepare which was good because I was also preparing four other dishes for dinner. Excuse the messy stove. Will had cleaned it before cooking, but I was all over the place making sure everything would be cooked in time. Simmering at the top right is fresh bamboo in a soy sauce and mirin broth. It was my first time preparing fresh bamboo in this way and it was so simple but highlighted the fresh bamboo so well I’m definitely going to make this a repeat performance. I wanted a no-fuss soup tonight so I made kimchi and tofu soup with the over-salted kimchi. 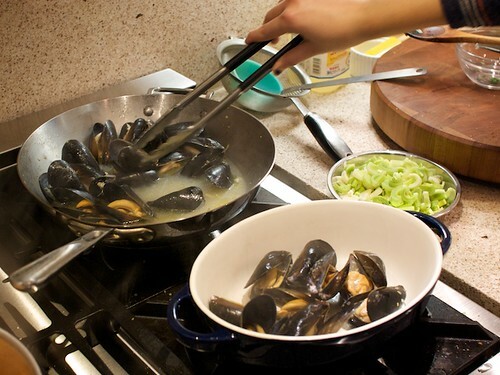 Transferring the cooked mussels into a serving dish. Toss toss tossing the spaghetti with leeks and mushrooms.